Lanvin will launch Éclat d'Arpège Arty, a new limited edition flanker to 2002's Éclat d’Arpège, which was a flanker to 1927's Lanvin Arpège. Notes for the fruity floral fragrance include lemon leaves, lilac, wisteria, green tea, peach blossom, peony, cedar, musk and amber. 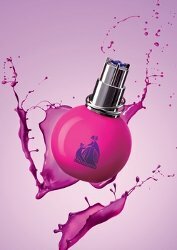 Lanvin Éclat d'Arpège Arty will launch in July, in 50 ml Eau de Parfum. not usually a pink person, but the bottle’s cool! Not sure what makes it arty, but agree, looks good! I think the hot pink plastic-looking material with the classic Arpege image superimposed gives it the ‘arty’ look. Its quite a contrast and works very well! Oh dear, I want that cute little bottle! I love Eclat d’Arpege so I will surely check this one out. I am trying to see how the notes in this one differ from the original and I can’t see any difference?? Huge apologies if it turns out to be a limited edition collector bottle & not a new juice…it’s very hard to tell. That’s what they did 2 years ago with the “pretty face” one. I just took a very quick glance at the notes and did not study them closely but they appeared to be very similar if not the same. Tthere could be slight differences. Either way, the bottle sure is cute! Wow! Cool bottle. Not to sound like a stick in the mud but still love vintage Arpege. Would like to sniff this. You are not a stick in the mud to me. Vintage Arpege is the best imo. Thanks! I always get told how great I smell while wearing it. Hard to beat. It sure is hard to beat! My mom wore the vintage Arpege a lot when I was growing up and the reform doesn’t hold a candle to the vintage stuff. It is glorious.